Drakenstein Stud’s exciting resident sire Duke Of Marmalade is set to be represented by a runner in one of the world’s biggest and most popular races. His son Prawn Baba is one of 14 runners set to contest the HK $18 000 000 Hong Kong Derby on March 19th. The gelding joins 13 other talented four-year-olds in the race, the third and final leg of Hong Kong’s Four-Year-Old Classic Series. Prawn Baba recently made history when one of eight winners ridden by Joao Moreira recently, and was impressive when scoring over 1800m at Sha Tin last weekend. 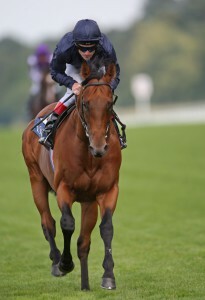 His Cartier Champion sire Duke Of Marmalade is set to be represented at both yearling sales next week. Five time G1 winner Duke Of Marmalade has one lot at the Cape Yearling Sale Thursday week –a daughter of three time winning Fort Wood mare White Wood Aster, from the family of champions Bluebird, Dark Mirage and Indian Skimmer. The son of Danehill has two on the March Yearling Sale – a colt out of a four time winning Jet Master mare from the family of champion Argonaut, and a filly out of a half-sister to G3 winning sprinter State Blue.